Get ready for some Domino Holiday Goodness! One of the fantastic things I love about the relationship we have with HCL through our IP partnership is the speed with which innovation is now happening within the Domino portfolio. It was only a few weeks ago that we delivered v10 on the 10/10 and on our promise to you, our customers and partners, on the journey that we set out upon last year beginning with Project Saphire, continuing through the #Domino2025 JAMs, and on our vision for the future with #DominoForever. Many of you are by now are aware of the agreement entered into earlier this month about IBM's intention to sell components of the Collaboration Portfolio (along with other software) to HCL, a transaction that is expected to be complete by the middle of next year. As an IBM employee, I am not at liberty to comment on the deal, nor can I comment on HCL's future intentions for the portfolio. Until the agreement passes regulatory approvals and is completed, your relationship with IBM is unchanged and as I am sure you have heard: It's "Business As Usual". My personal opinion is that - should the deal go ahead as agreed - the Collaboration Portfolio will be in extremely good hands moving forward. 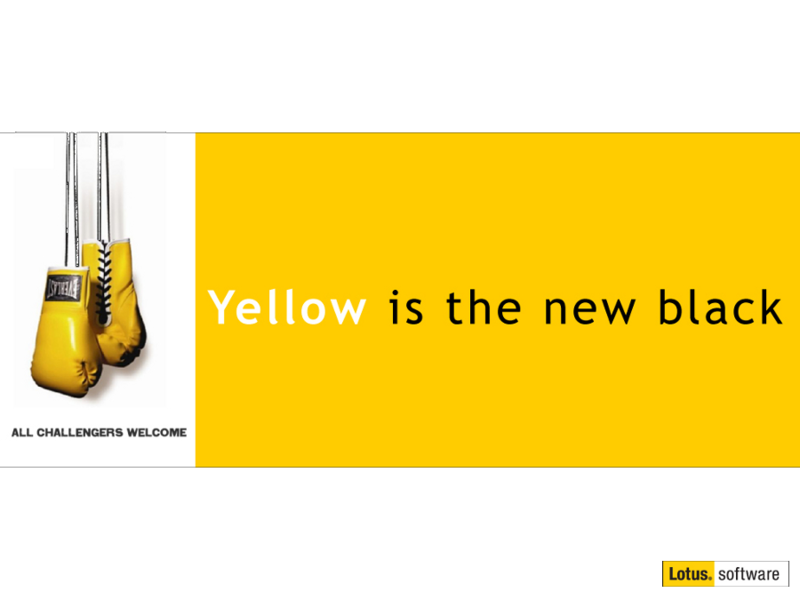 Comments that have been made publically by HCL executives clearly demonstrate a commitment to the future of the products that those of us in the Yellowverse know and love so well. One only has to look at the effort and investment HCL has already made in the portfolio covered by the existing IP agreement to realise that there is renewed vigour in the platform. The customers that I have introduced to the HCL Lab Advocacy programme are already benefitting from the advice provided to them by their HCL Lab Advocates, and of course, many of you have already engaged with HCL Support Staff when raising cases for assistance (AKA: PMR's). Additionally, since Connections is also included in the agreement; I would love to see that product back in the hands of Jason Gary, who was responsible for evolving the "Pink" vision for the product while he was at IBM. Given everything that has happened during the past 12 months, I personally feel supremely confident in the future for the portfolio. Two of the things I know many of you have been asking about in Notes 10 Client for Mac, and the Dominio AppDev Pack, are big highlights and both are included with this release. There are lots of things to love about the latest releases in the Domino Product Family, included below are some of the highlights, and links to the "What's New" pages so that you can drill down into the individual capabilities to get more details. You no longer have to rely on third-party products to automate deployment of new versions and updates of IBM Notes®. Instead, you can enable Auto Update (AUT) servers to deploy Notes updates automatically. The IBM Notes management solution MarvelClient Essentials from panagenda is provided with IBM Notes and Domino 10.0.1. The SSL cipher options in the Security tab of Internet Site documents or in the Ports tab of Server documents now clearly list all of the supported SSL ciphers, in order of strength, for easy selection. Notes 10.0.1 is now available on the Mac platform. Notes 10.0.1 on the Mac supports the new features introduced in IBM Notes 10.0. In Notes 10.0.1, you can create a one-time signature at the time you reply to or forward a message. As you reply to or forward a message, select Signature > Reply And Forward Message Signature and then create the signature. You can now import single and repeat events from an internet calendar into your IBM Verse calendar. For example, import events from your Google calendar. Choose the language to use in IBM Verse. 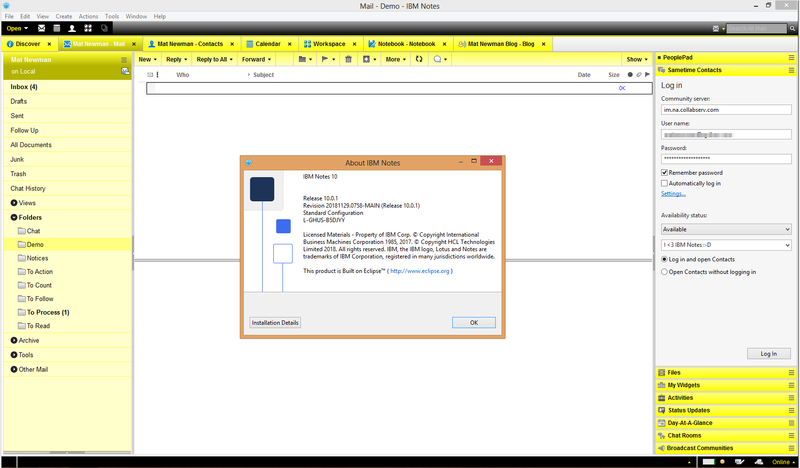 IBM Verse 1.0.6 can now be run on Domino® AIX® servers. As you can see from the Banner, I've already installed and been playing with the updated Notes 10.0.1 client, and I like it's responsiveness so far. Finally, there is a really good reason to go over and visit the DominoForever site and read all about the Domino V11 JAMs that we have coming up in January where we have provided local contacts in a city near you when you can attend and have your say on the future direction of the Domino Product Family. If a JAM in Pittsburgh, PA would be useful - look me up, please. The Unofficial Poster Child for Notes and Domino. Any news on the long awaited iPad version of Notes?